Geyser eruptions at Yellowstone National Park are moments of rarefied beauty; spectacular reminders that we live on a geologically-dynamic planet. A recent eruption was also a reminder that we’ve turned said planet into a dumpster. On Sept. 15, Ear Spring—a typically quiescent thermal pool on Geyser Hill in Yellowstone’s Upper Geyser Basin—shot hot water and rocks up to 30 feet into the air. But that isn’t all the spring coughed up. A subsequent survey of the landscape around the vent revealed a “strange assortment” of “foreign objects,” including a surprisingly large collection of coins. A pencil, a plastic cup, and a couple of tin cans that look like they went down with the Titanic were also found at the scene. 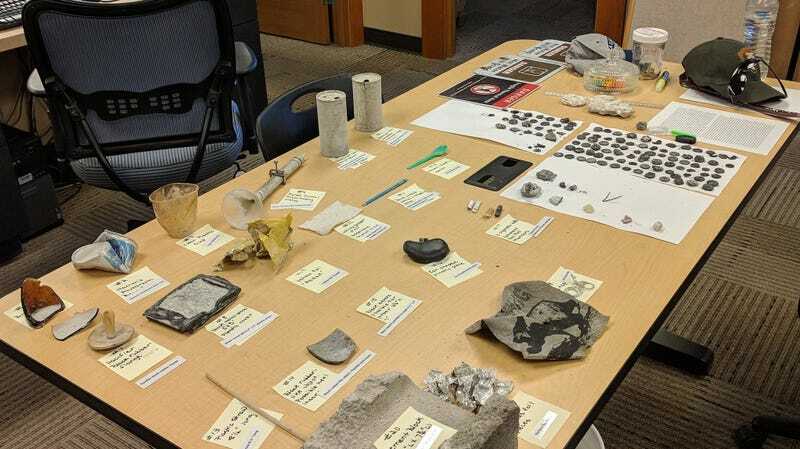 So was a Pyrex funnel, three cigarette butts, and an “ear-shaped plastic piece” according to a meticulously-labeled photo the National Park Service (NPS) released with a Facebook post detailing the world’s saddest new collection of geologic memorabilia. Ear Spring is located near some of Yellowstone’s most cherished hydrothermal features, including the frequently-eruptive cone geyser Old Faithful. According to the U.S. Geological Survey’s (USGS) Yellowstone Volcano Observatory, witnesses saw smaller outbursts as recently as 2004, but 1957 is the last time the spring has seen an eruption of this size. Since the event, the USGS has noticed other changes in hydrothermal activity on Geyser Hill, including the formation of a new hydrothermal feature under a boardwalk near Sponge Geyser. Mike Poland, Scientist-in-Charge at the Yellowstone Volcano Observatory, told Earther that these sorts of changes are “not abnormal at all” for Yellowstone’s geyser fields, and the recent activity is garnering attention mainly because it’s occurring in places with high foot-traffic. None of the hydrothermal outbursts are in any way indicative of changes in Yellowstone volcano, whose magmatic plumbing system lies several kilometers underground. As usual, an eruption isn’t imminent. Concord University volcanologist Janine Krippner, who has heard a lot of strange news about volcanoes, told Earther that a hot spring or volcanic system belching up trash was a new one for her. She added that it “makes sense” if people are leaving their garbage around geothermal areas. In response to questions on Facebook, the NPS said the most likely scenario is that the garbage pieces “fell, blew, or were thrown” directly into Ear Spring, rather than traveling there from some other part of the geyser basin. The trash is being inventoried and some artifacts—like a baby’s pacifier that may date back to the 1930s—could end up in the park’s historical archives. In the meantime, Yellowstone’s caretakers have a salient message for anyone planning a trip to see a hot spring: This isn’t some damn wishing well.